I tasted a peach that fell on the ground today. They are almost ready. I never buy peaches because every summer I get a full tree of peaches. For a month, I eat peaches every day to the point that I don't want to think about peaches for the rest of the year. There are two peach trees of different varieties on the farm. The big tree grows big fuzzy soft peaches while the smaller tree in the front of the house grows fuzzless crunchy peaches. I can see that I don't have as many peaches on the big tree as I had in previous years. I believe there are two reasons that resulted in the smaller quantity this year. I pruned the main tree a bit late. Ideally I should have pruned it back after the peaches were gone in November or December. I didn't do it until February because I didn't know how to prune fruit trees. Secondly, it rained more and longer than usual this year. Last rain was on June 8th! Even though I sprayed the trees with copper sulfate twice, the trees are more infected with leaf curl than past years. Peach leaf curl is caused by fungus (see the brown tumor looking blob on the leaf in the picture below). Nevertheless, I will have more peaches than I can consume in one month. Birds and squirrel will get their shares, and there will be peach cobblers and peach pies. I try getting supplies off Craigslist.com or Freecycle.org whenever possible. As Master Ken always says, "Low overhead, high return." However; sometimes you really need to get something quick, and nobody is giving that something away for free. Last year I "discovered" American Soil and Stone, which happens to be down the street from the farm. I don't know why I never knew about this place before. It turned out that just about everyone I knew who work on their gardens get their supplies from American Soil and Stone. They have all kinds of soils & blends, soil amendments, barks & mulches, gravel/crushed rock, sand, and landscape supplies. The prices are much better than any chain store. I just picked up their most updated price list this morning, which doesn't seem to be available on their website. If you are getting bagged items, such as bagged soil or mulches, you go to the office to pay for them first. You will get a receipt for your items. Follow the signs and drive your car around to the pick up area and hand over your receipt to one of the vested staff members. They will put those heavy bags right into your car for you. It's so much easier than going to places like Home Depot or OSH, where sometimes you can't get anyone to help you. The facility is huge with rocks as far as your eyes can see. This place is my favorite supply store for my farm. I don't usually plant flowers because I consider them none producers and high maintenance. I have a small flower bed in the herb garden near the front door, and I picked all drought tolerant flowers. The rest of the flowers just pop out on their own. I can't get rid of them even if I want to. Some of the regular flowers I have are calla lilies. They are mostly white but I noticed this light pink one just popped out next to the back door all alone. I also have plenty of nasturtium plants. They grow like weeds. I didn't know the flowers are edible until I saw them in salad mixes at some farmers' market. Still, I have never tasted it. I suppose if I was left with nothing to eat, I'd give it a try. Then there's California poppy, our state flower. They pop out everywhere and each flower produces a seed pod. When the pod is completely dry, it pops open and hundreds of tiny black seeds just fly all over the place. As a result, they start growing out from cracks on the drive way, cracks between bricks, and cracks on the patio. If you want some California poppy seeds for cooking or whatever, let me know. I can give you some seed pods. Feel free to take them from the front garden. I just had 5 half wine barrels delivered to the farm. Aren’t they beautiful? You should smell them! I don’t even like the smell of wine or alcohol, but I love the smell of authentic wine barrels. These barrels retired from a local winery recently, but they will now continue on as planters to create more life and food. Wine barrel planters are new to me. 3 months ago was the first time I was solicited with them. I didn’t know why this guy was trying to sell my permaculture class wine barrels. Later on I saw these half barrels at John’s farm, I then realized what they were for. I got a couple of them to try and wanted to get more. I later on told the guy that he needed to explain what the barrels are for so newbies like me would understand. I have seen places like OSH and Home Depot selling wine barrel planters. Don’t be fooled by the imitation barrel planters in the stores. They are cheaply made to look like wine barrels, and the stores want to charge you more for them. The real wine barrels are made of oak and quite heavy. You can see the fine workmanship in these oak barrels. A good place to look for them is Craigslist.com under “farm+garden”. They range anywhere from $25 to $50 each. Some people will deliver to you at no extra charge depending on your location. Make sure that the bottoms of the half-barrels have holes for drainage if you are using them as planters. Some sellers will drill the holes for you at no extra charge or you can do it yourself with a drill. 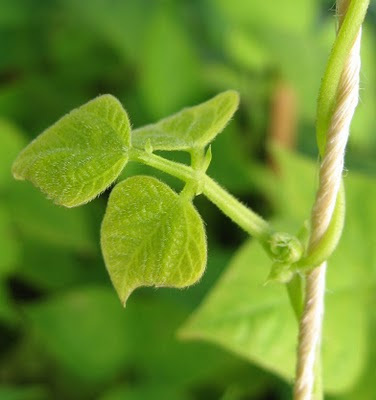 This year I am growing green beans in a half-barrel. The beans are doing great! I will be using these newly acquired barrels for bamboos, herbs, and melons. I’ll be working on the farm this weekend. Can’t wait! I have been nursing some Japanese cucumber, cantaloupe, and honeydew melon in the garage. I planted all of these earlier, but most of them have been devoured by pill bugs long ago. I have been trying to figure out where to plant these newly acquired seedlings. I walked in the garage this morning and was surprised to find a bird chirping inside. The bird must have gotten in there last night when I was unloading all the stuff from solstice convergence. I walked over to the table where the seedlings were. "Bad bird!!!" I yelled in my mind. 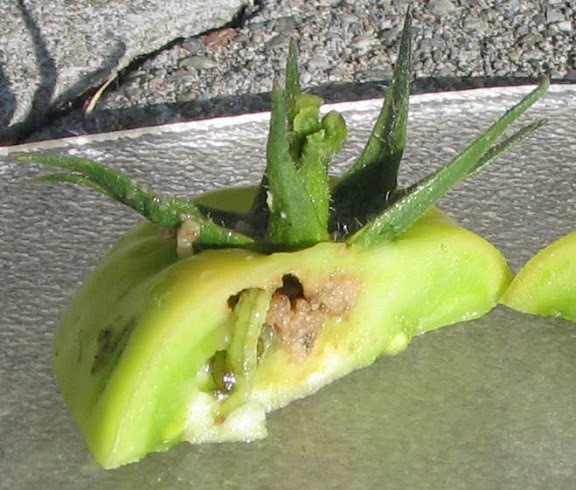 The bird had chomped off an entire 4-inch cantaloupe plant, ate about half of the new leaves and torn off several bigger leaves. I opened the garage door, and the bird slowly made its way out by hopping on the floor towards the light. I moved the seedlings into the sun room where I can keep a closer eye on them. This was not the first time a bird was trapped in the garage during all the years I have lived here, but it was the first time it has attacked my plants. This was quite an ambitious schedule. I was not able to attend everything that was on the list, but it was definitely a fun filled day. It was also the first day of Master Ken's herb class, so I went to the class first. There were mostly new people in this class, and unlike Master Ken's two other classes, mushroom cultivation and beneficial beast, this one is mostly women. I was a little surprised by that. Maybe guys just don't feel like learning about herbs? Two guys were in charge of the fritter fry booth at the outdoors kitchen. They fried up all kinds of vegetables, fruits, mushrooms, cheese, and snails. They had a beautiful display of squash blossoms. I had fried strawberries, raspberries, bananas, cheese, oyster mushrooms, and even a squash flower stuffed with garlic and blue cheese, I think. I am not sure exactly what he stuffed it with, but it was delicious. I am a firm believer of anything deep fried tastes great. It was my first time having a deep fried flower. I always felt a little weird about eating flowers. I have zucchini flowers on the farm. I should just pick them to make some tempura. Tellur, a herbalist from Blue Wind Botanical Medicine Clinic, had a nice display of various medicinal herbs. He also did some demos. My association of medicinal herbs while growing up in Asia was not exactly a positive one. I have been skeptical ever since due to childhood experiences. However, I like Master Ken's approach, which is to use medicinal herbs to prevent illness and not to cure illness after already falling sick. The convergence ended with a potluck. I had not been eating much meat for quite a while, the BBQ was actually a little hard to eat. Other than that, it was excellent. I even got to take some mixed vegetable soup home. I was glad the shortbread cookies were gone pretty quickly. I think they were just the right size. Everyone I talked to liked lemon-lavender cookies better than rosemary cookies. I already have a couple ideas to improve the lavender cookies for next time. I would like to grow a cabbage this size in the front yard just to show people how awesome it looks. I wonder if the deers would eat it? 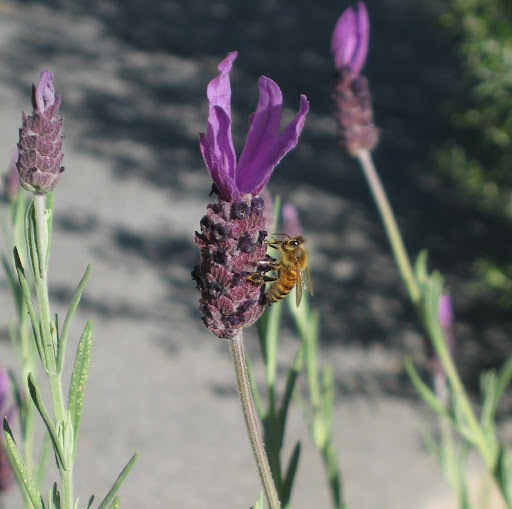 I was about to clip some lavender and spotted a few honey bees in the lavender bush. Watching them flying around lavender blossom took me back to that day when I made my connection with them. Like most girls, I was not particular fond of insects especially ones that sting. Most insects are not cute to me. The buzzing sound of bees were scary until very recently. The campus where I take my horticulture classes has a few bee boxes. 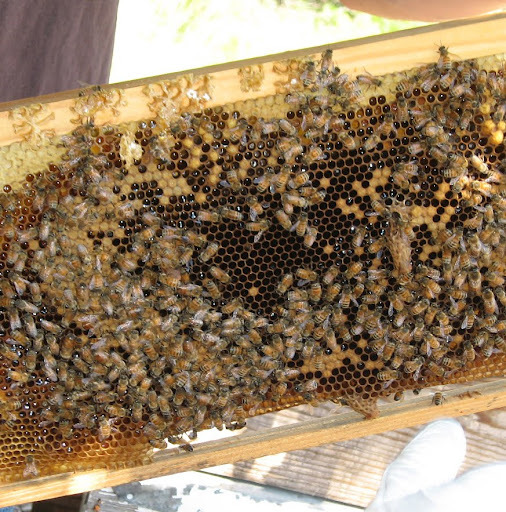 We check on the bees regularly as a class activity. I normally stayed further away than most people. I have never been stung by a bee, but base on what I know about myself, I am nearly 100% sure that I am allergic to bee stings. My skin swells up at the slightest irritation. I am often covered with red rashes just from being around weeds. The rashes usually go away on their own, so I stopped thinking much about it. 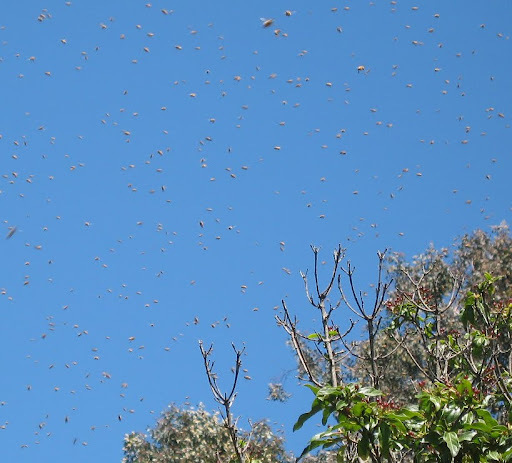 On May 2, 2010, I was hanging out on the campus farm when someone spotted a swarm of bees. The few people from my class who stayed late were very excited at the opportunity of capturing the swarm. Now you wonder how you are going to "capture" a swarm of 400-700 bees? My mentor, Master Ken, will tell you to be very slow, gentle, and calm, and you will then be able to sweep the swarm of bees into a paper bag with your bare hand. He has described this process to us in the class, but it had not been witnessed by us. They found the actual swarm resting on top of a tree while the loose bees were flying around in search of a new home. The guys went and got 2 ladders in order to reach the bees on the tree. They also got a cardboard tube to put the bees in. They had to carry all these things and climb over a tall wire fence to get to the tree with the bees. It took them about an hour to come back to the campus side of the fence with a tube of bees. I was too wimpy to get over the fence to where the swarm was. I didn't even want to hold the tube of bees in my hands. However, as I watched the others (yes, there were girls, too!) handling the bees without any protective clothing, I grew more confident. The bees meant us no harm. They were peacefully doing their own thing. 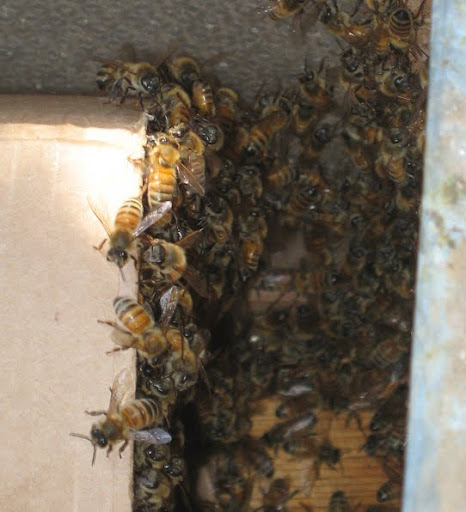 For the first time I got close to the bee boxes so I could take a closer look at them. They were these fuzzy creatures with big eyes. When they returned to the boxes from working, they carried pollen sacks on their hind legs! How cute! I tasted the sweetness of fresh pure honey from the hive, too. Nobody got stung that day. 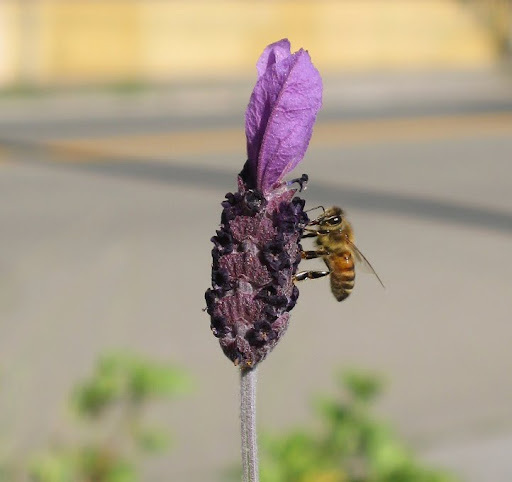 That day I made a connection with honey bees. I know I am not quite ready to keep my own boxes on Sand Village Farm, but I no longer flinch from the buzzing sound of their wings. If they need to take a break on my shoulder, I am okay with that. See The Secret Life of Bees photo album for more pictures from May 2, 2010. I have collected many baskets over the years. Each of them is used for a different purpose. This small round basket is my meal basket that I keep next to the fridge. This evening I cut some Bloomsdale spinach, broccoli de cicco, and green onion for my noodle soup. Both spinach and broccoli are my favorite greens. I am happy with the result of growing both vegetables this year. I have totally failed on growing spinach last year, and the broccoli was infested with broccoli worms and aphids. I didn't want to give up on my favorite veggies, so this year I started growing spinach seeds in the green house until they were at least 6 inches tall. Still, they started to look beat up after transplanted outside. I think it had to do with the late summer this year. It's been usually cool and wet this year. It took several weeks for them to adjust and started to thrive. All the spinach plants are flowering now. I will soon be able to collect seeds for next year. I came upon a posting of 4-inch 6-pack broccoli de cicco for sale on Cragislist.com. I didn't know what broccoli de cicco was until further reading. I was excited since I love the idea of eating all parts of broccoli. I ordered 2 6-packs of broccoli de cicco, and about half of them died off. The other half started to do much better after I transferred them to a different vegetable bed with a different soil mix. I was worried about broccoli worms and aphids. Amazingly, only one small floret was infested with aphids and no worm on any of them. I am not sure why I didn't get the worms this year. A few things I did differently with the broccoli this year are: different location, different variety, further spacing, and I eat the florets early instead of waiting for them to get bigger. Last year I wanted to wait for them to get bigger, and they turned into caterpillar food. 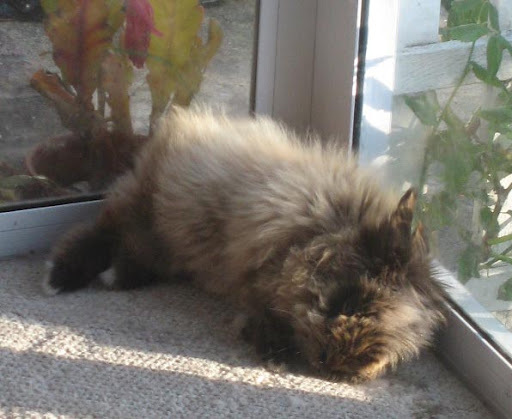 Our resident bunny, Dusty, is a fluffy hair ball. 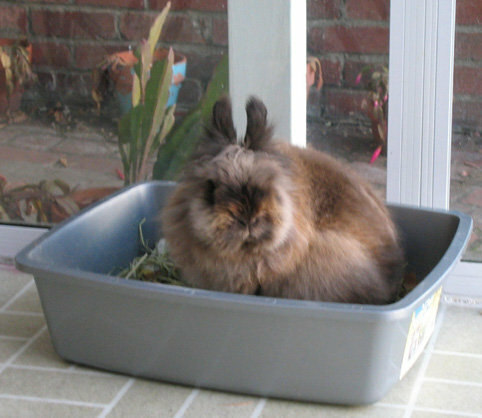 He is a lionhead, one of the newest breeds of domestic bunnies. Dusty was under socialized before I picked him up on Mother's Day in May 2004. He usually hops away to hide in his plastic recycling bin when someone approaches. He does that with me, too, so don't feel bad when he runs away from you. He might come up to you if you have a piece of apple or raisin, but you must be patient. You have to wait for him to go up to you instead of running after him. 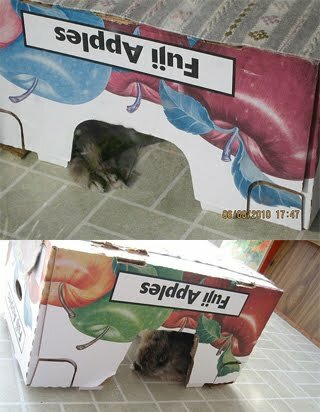 Dusty has quite a cushy life as a bunny. He stays inside of the sun room (a.k.a greenhouse #2) most of the time. He gets brushed and manicured every once in a while. He gets to lay around in the yard in a safe enclosed area sometimes. His litter box gets cleaned out regularly. Of course he gets fed everyday. I wouldn't mind having a life like Dusty's. He contributes to Sand Village Farm by providing high quality fertilizer. The content of his litter box always goes to the compost bin. The compost goes to all the fruit trees and vegetables. I am growing some sweet basil for the first time this year. Basil is not something I use in my cooking frequently. Basically I use it for lasagna, pizza, and pesto sauce. Why is it called "sweet" basil? It's not sweet to me. Out of curiosity, I look it up on Wikipedia to see what Wiki has to say about sweet basil. "Basil (Ocimum basilicum) (pronounced /ˈbæzəl/ or /ˈbeɪzəl/), of the family Lamiaceae (mints), is a tender low-growing herb. Basil is a culinary herb prominently featured in Italian cuisine, and also plays a major role in the Southeast Asian cuisines of Taiwan, Thailand, Vietnam, Cambodia, and Laos. The plant tastes somewhat like anise, with a strong, pungent, sweet smell." Sweet basil in the Southeast Asian cuisines????! I don't remember ever noticed sweet basil in Asian cuisines. There's Thai basil in Thai dishes, and that's about it. I read a little further down on the Wiki page on other basils. "Most of the Asian basils have a clove-like flavour that is generally stronger than the Mediterranean basils. The most notable is the holy basil or tulsi, a revered home-grown plant in India and Nepal. In China, the local cultivar is called (traditional Chinese: 九層塔; pinyin: jiǔ-céng-tǎ; literally "nine-level pagoda")..."
"九層塔"! OMG! I remember this name. I was just a kid then and I couldn't stand the smell! When I asked my mother that that smell was, she told me it was 九層塔, and I never forgot that name as something to avoid. There are three herbs that I absolutely can't stand, and this"nine-level pagoda" is one of them. I had not idea that's a type of basil as well. My pot of sweet basil was getting over crowded, so I divided it into 4 smaller pots. Mmmm, the smell makes me want to make a Margarita pizza. It's 90 degrees today. This is too hot for me to be out there fighting the weeds but perfect for working in the green house. I clipped some red monkey flowers, Provence lavender, Spanish lavender, rosemary, and Roma tomatoes. I will start with these since I have plenty of them. I purchased 3 pots of monkey flowers 2 years ago, but only one of them survived. The surviving bush is doing really well, so I am going to see if I can expand the monkeys. Master Ken, my mentor, always makes it seem so easy to grow anything. He also makes his cuttings and pruning in an amazing speed. It's all second nature to him. It took me almost an hours just to get these cuttings ready for rooting. I don't t think any of my peach cuttings had rooted from a couple months ago. I also didn't use rooting hormone on those cuttings. This time I got a bottle of rooting hormone. Since I am trying to keep my cost down, I decided to make my own rooting medium instead of buying perlite. I know it has to be light and airy so the roots can grow easily, so I mixed some potting soil (1/3) with completely dried horse manure mixed with wood shavings (2/3). I misted the mixture with the water bottle. I dip each cutting into the rooting hormone powder then stick it into the rooting medium. Tomatoes are supposed to root very easily, so I am skipping rooting hormone on them. After every cutting is in place, I mist everything thoroughly. Since I don't have a sprinkler system in this makeshift greenhouse, I will be misting these cuttings several times a day whenever possible. If everything goes well, they should root in 3 to 5 weeks. One of the side effects of becoming an urban farmer is that I became fascinated with bugs. Bugs used to be something I only noticed when they got inside of the house. Usually I would either kill them or kick/chase them out. 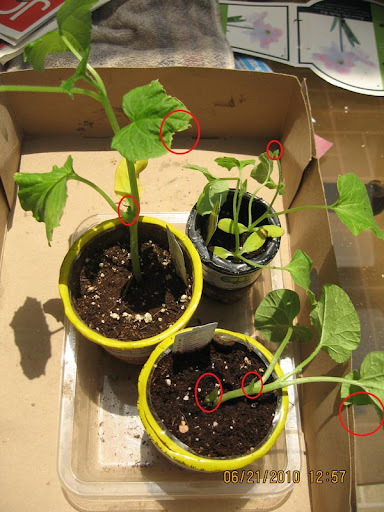 Once you start to grow your own food outside, you will start to notice all kinds of bugs. Now you can't kick them outside because they ARE outside. For that reason, I usually don't try to kill them. After all, they are where they are supposed to be - outside. However, in order to protect the result of your hard labor, you will start to observe the bugs. What are they? What are they doing to your fruits (or vegetables)? How to protect your crop from these bugs without using toxic pesticide? My very first tomato had a nasty worm inside. Gross! At the same time, I was so fascinated that I had to keep a picture of it. You will start to appreciate beneficial bugs such as bees and ladybugs. Not only I appreciate honey bees, I respect these little fuzzy guys for spending their entire lives collecting pollen and help pollination during the process. Without them, we would have no honey and much less fruit to eat. That would be devastating for me. There is nothing like the sweetness of natural golden gooey honey.